In a 4-minute SoundCloud interview with the Indigenous Environmental Network, Angela Bibens describes the devastating effects of tear gas, rubber bullets, concussion grenades, mace, and water cannons used on 400 peaceful protestors in North Dakota by local police in the last 48 hours. The confrontation arose as protestors attempted to move two burned trucks off Backwater Bridge just north of the Oceti Sakowin "Water Protector" Camp, which had blocked the main route to the city of Bismarck and delayed emergency services. According to Bibens, several demonstrators suffered seizures, broken ligaments, loss of bowel control, and, in some cases, loss of consciousness, including one elder who went into cardiac arrest. A reported 300 people have been injured, 26 hospitalized, and several arrested. Both the Standing Rock and Cheyenne Sioux Tribes deployed emergency services for on-the-ground resuscitation and opened a nearby community center for evacuation. The Morton County Sheriff's Department tried to justify their use of force by calling the protestors "very aggressive" and framing their demonstration as an "ongoing riot," while simultaneously denying their use of certain less-lethal weapons entirely. 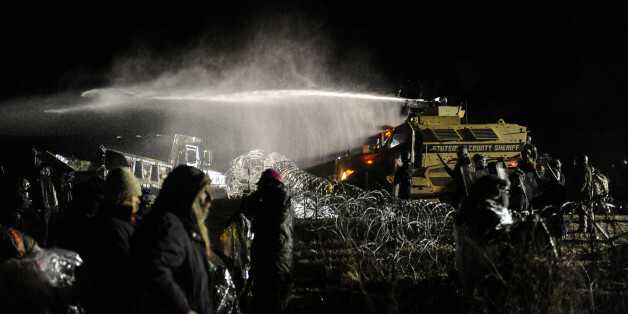 In a press conference, Sheriff Kyle Kirchmeier told reporters, "We don't have a water cannon. I don't know where the term water cannon comes from. This was basically just a fire hose." The sheriff's office claimed that fire trucks were used to stop fires they say were started by the activists. But a video posted to Twitter Monday clearly shows authorities drenching protestors in areas where there were no fires, using tanks that bear no resemblance to fire trucks. The health risks associated with deploying these weapons cannot be understated. In a joint report by the International Network of Civil Liberties Organizations (of which the ACLU is a founding member) and Physicians for Human Rights, water cannons are characterized as particularly dangerous and life-threatening weapons. The use of water cannons can induce facial, skull, and rib fractures; brain trauma; bruises; prolonged nausea; and even blindness. Water cannons have been attributed to deaths in Indonesia, Zimbabwe, Turkey, South Korea, and Ukraine. In North Dakota this weekend, temperatures reached 26 Fahrenheit, or -3 Celsius, making the targets of water cannons also susceptible to hypothermia and frostbite. A member of the Standing Rock Medic and Healer Council told reporters that she could hear the sound of clothes "crunching" as people walked in garments frozen to their bodies. For this reason, the Healer Council demanded the immediate cessation of these weapons and expressed concern for "the real risk of loss of life due to severe hypothermia under these conditions." Use of unjustified force and massive less-lethal weapons by law enforcement against largely peaceful protestors is all too familiar. We've seen it in Ferguson, Baltimore, even in Standing Rock this past month. The ACLU and other groups warned against abusive police practices at Standing Rock and called on the Justice Department to investigate possible constitutional violations and suspend police use of federally supplied military equipment. "The right to freedom of peaceful assembly is an individual right, and it cannot be taken away indiscriminately or en masse due to the violent actions of a few ... the use of violence by some protesters should not be used as a justification to nullify the peaceful assembly rights of everyone else." And construction of the pipeline has continued despite a call in September by Victoria Tauli-Corpuz, the UN special rapporteur on the rights of indigenous peoples, for it to be halted for posing a significant risk to the drinking water of the Standing Rock Sioux Tribe and to their burial and sacred sites. To make matters worse, the atrocious use of excessive and disproportionate police force is imperceptibly softened by news outlets that frame Sunday's confrontations as a "clash." It suggests there is an equal balance of power between the militarized police force and weaponless demonstrators. It is a catastrophe with serious human rights implications. Nearing the eve of Thanksgiving, a holiday remembered by many indigenous peoples for its legacy of American colonization and genocide, Sunday's showdown is a contemporary illustration of an age-old oppression that this country must reckon with.